Adam was born in Melbourne, Australia and was introduced to the world of theater at an early age working mainly in acting, choreography and script writing. 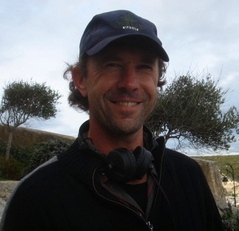 With the wonderful support of a dedicated crew, he took on the challenge of directing and producing a film in a foreign language on the beautiful island of Corsica. 'Le Saut de L'Ange' (Angel's Leap) has received excellent international review and has won a Remi Award at the WorldFest International Film Festival. "When we shot Angel's Leap in Corsica, we had a crew from six countries. It was a wonderful experience. I like to offer creative possibilities to others who want to work in film. When people place their trust in me and offer support with a project, it motivates me to create something wonderful. "